Relationships require work. They require mutual respect, honesty, support and unconditional love. But, what happens when one partner does not recognize how destructive they are being? It’s usually the simple comments, comparing, and jokes that become malicious. Behind every comment that ends with “I’m just kidding” there is some truth that opens the door to dishonesty. It’s in these moments that the we are triggered with the insensitivity of our mates. 1. Compare your mate to another person. Nothing hurts deeper than someone comparing us to another. Whether it be body size, hair, clothing style or mannerisms, it’s painful to feel that we aren’t good enough. Also, no one wants to be sized up against an ex. If you are comparing your new mate to your ex, you shouldn’t be with this new person. It’s hard enough to start relationships on a clean slate. Everyone has a past, but when we are compared to someone we haven’t even met, we tend to take those things even more personally. Magazine ads are photoshopped. People are not. It’s time we are kinder and gentler with our partners. 2. Pretending you are listening. You are either on the computer, or watching television, and you aren’t hearing what your mate is saying. You say whatever you feel will get you back to what you are doing. You agree even when you aren’t hearing what is being said. So, you disregard his/her questions and get back to the business of keeping your attention on the screen. 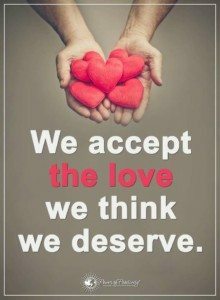 There is ugliness in not accepting and acknowledging your partner. There is a sense of loneliness and rejection in not really seeing them or hearing them. 3. Criticizing them in front of others. When you judge or criticize your partner in front of others, it is demoralizing. You aren’t just making him or her look bad, you are making yourself look really mean. If you think that others don’t catch the sarcasm, the little comments that are put-downs, or the arrogant remarks, you are truly living in your own universe. People notice those things. It says a lot about character, compassion and the type of person you are. It’s in the small comments that your partner sees your inconsideration, your disrespect and the ability to manipulate with an audience. 4. Calling them by pet names that may embarrass them. You can’t call your partner, “Chunky Monkey” and expect them to feel good about themselves. Nicknames are not always terms of endearment. They can be sarcastic and disconcerting. When you patronize your partner, especially in front of others, you are not making a point. You are devaluing them and adding salt to an already open wound. It’s one thing to encourage your partner to lose weight, work out together, and eat healthier. It’s another to call them out in public, or even behind closed doors. This is manipulative and abusive. It’s hurtful, distasteful, and it creates a huge barrier in the relationship. Even if you think it’s “cute,” don’t do it. 5. Telling them they look awful in an outfit. You might think you are helping your partner out by voicing your opinion, but the moment you judge an outfit, a hairstyle, makeup, or whatever else pertains to looks, you are hurting that person. Unless you are a professional stylist, it’s best not to input on how your partner looks. Most of us are doing the best we can with what we know. There are sensitive ways to sharing how you feel with your mate. You can say, “I don’t like that outfit” rather than, “You look awful in that outfit.” There is always a healthy and positive way of expressing things that come out less harsh. You do not have to be so blunt that the person feels they are ugly, whether it be the dress or slacks. You are a reflection of who you associate with. When you start to tell your partner that you don’t like their friends, you are creating a huge division. You don’t have to like his or her friends, and you can start to make new friends together. But, telling your partner that his or her friends are horrible is not going to be an easy win in the long haul. Good friends stick around. You cannot judge every single person and make your mate feel bad about who is in their lives. When you compare your mate to that friend you dislike, you are truly being arrogant and distressing. If you are in a committed relationship, you should be able to discuss issues, challenges and have deep conversations about the things you like and don’t like. Respect is a two way street. You should always treat your partner with the same respect and appreciation that you expect. There is always a loving way to reach an agreement. It’s a matter of being kind.